Ok fine. Its not really Pancake bread. Its Eggy Bread, or French toast. But the smallest doesn’t like egg, so if I call it eggy bread she wont eat it. Pancake bread however, she will wolf down, as will the older child. Pancake bread is a fab way to send crumbly gluten free bread to school without it crumbling. And its better then bread, its pancake bread! Right..? -Whisk the egg with some milk (about one table spoons worth) in a shallow bowl with a fork. -Fry soaked-in-egg-bread in a frying pan with some butter or oil, you need to make sure the egg is cooked, but it really is very fast. 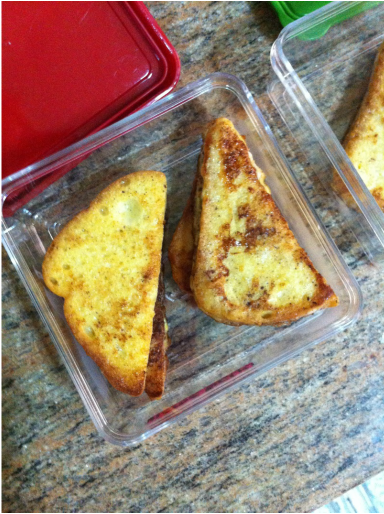 This entry was posted on 12/11/2012 by glutenfreeuae in Lunch Boxes, Recipes and tagged glutenfree, kids, lunch, lunch box, lunchbox, pancakes, school lunch.